What do your project plans look like for your client work? Are they working for you, or just more work for you? If you’re looking for a better process for your business, look no further! Jennifer Bourn is going to share with you a practical system that Bourn Creative has not only tested and refined over five years, but used on hundreds of real client projects. This is a battle-tested solution that will help you relieve stress, boost your profits, add value to your service offerings, and create happy clients. Have you ever felt like you’re drowning in your business and just can’t get ahead — like you’re so busy doing the actual work, it seems like you’ll never have time to work on your own projects and ideas? Did you began freelancing to have more freedom and spend more time with your family, but that isn’t exactly how things shaped up? Are you making good money, but wish you had better margins and higher profits so there was some “wiggle room” in your business? If you answered yes to any of these questions, this session was created just for you! 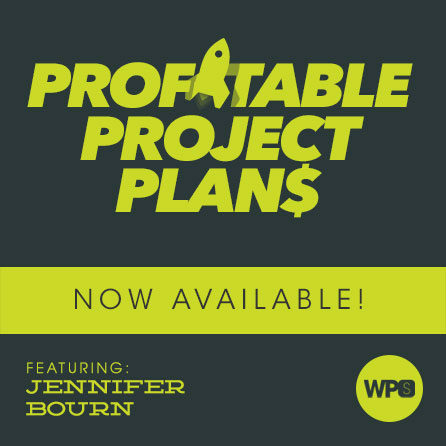 Jennifer Bourn will be joining WPSessions for a deep dive into the reality of making more money and working less. No internet marketing hype. No bull. No fluff. Just the exact strategy she implemented that cut admin time on client projects by more than 50% and skyrocketed profitability — and if you are connected to Jennifer in anyway on social media, you may have noticed just how much “freedom” she enjoys, while growing a solid WordPress design an development agency that celebrated its 12 year anniversary this July. Jennifer walks her talk. Bourn Creative serves a full book of clients in the “not quite enterprise” space, has a full pipeline of prospects who want to work with the company, and produces remarkable work. Yet at the same time, partners and spouses, Brian and Jennifer travel and adventure with their children more than pretty much anyone. But how do they manage administrative tasks associated with running the business, project and client management, doing the actual client work, and providing extraordinary service, while vacationing so much? That’s exactly what we’re going to cover in this webinar. Things weren’t always so rosy for Bourn Creative. There was a time when Jennifer was drowning in her business. She was working 16-18 hour days, 7 days a week, and no matter how hard she worked, she wasn’t ever getting ahead. When she focused on the work clients hired her for, she fell behind on administrative tasks like invoicing, estimating, and email, which resulted in less leads and lost business because she was just too busy doing the work to follow up. But when she focused on winning more business and getting to inbox zero, she fell behind on the production side, which resulted in stress, overwhelm, and frustration, and risks of missed deadlines and unhappy clients. Then things began slipping through the cracks and Jennifer realized that not every Bourn Creative prospect and client was having an extraordinary experience when interactive with her brand, and she knew things needed to change. Bourn Creative needed higher profits and better margins. It needed more wiggle room and less stress. And Jenifer needed the freedom and life she thought she was going to have when she started freelancing. Really, she just wanted things to be easier and to be able to step away from work and enjoy life without massive amounts of stress and panic. As a result, she created a step-by-step process for managing custom WordPress projects and client from initial sale to post project follow up — a process that could be automated to reduce hours and drive up profit margins, all while serving, supporting, surprising, and delighting clients. In this WPSessions webinar, Jennifer will share exactly how she restructured her entire design and development business to leverage internal client management systems that move projects forward without her and make clients feel cared for and valued. This is not a theoretical system, or a system that had success a handful of times, but a practical system that Bourn Creative has not only tested and refined over five years, but used on a few hundred real client projects. It’s a battle-tested solution that will relieve stress, boost your profits, add value to your service offerings, and create happy clients. Jennifer is an award-winning designer with a penchant for writing. She has been in the design, web, and digital strategy trenches since 1997, working with corporations, casinos, professional sports teams, magazines, creative agencies, political campaigns, small businesses, and entrepreneurs alike. Today she runs Bourn Creative where she consults on brand, website, and digital strategy.